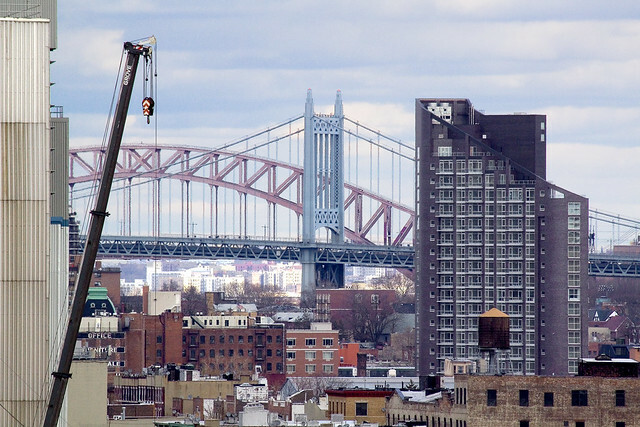 Happy Birthday, Triborough Bridge, you’re now an Octogenarian. 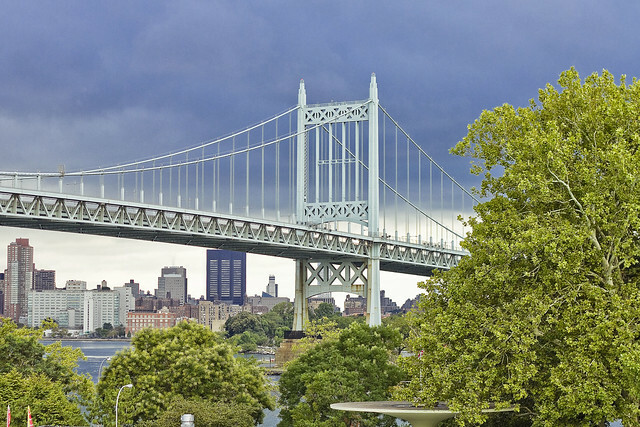 Triborough Bridge, aka Robert F Kennedy Bridge, in Astoria, Queens opened on this day in 1936. It was 80 years ago today that Bob Moses taught the band to play, as it were. 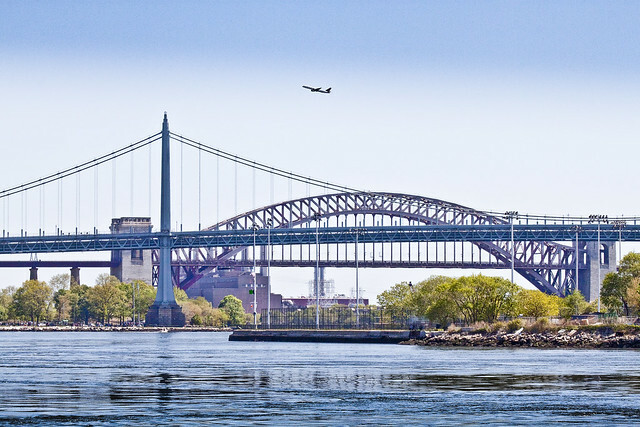 The bridge complex (there’s actually three spans that compose Triborough, pictured in today’s post is the suspension bridge section which connects to Astoria) was designed by the team of Othmar Amman and Aymar Embury ll. Construction on the thing began on the so called “Black Friday” of 1929 which signaled the beginning of the Great Depression. Moses wanted to build parkways and expressways, ultimately, and proposed to NY State that his high speed roads could serve as the approaches for the Triborough. His “Grand Central Parkway,” “Astoria Blvd.,” “East River Drive (now called FDR drive),” “Whitlock Avenue,” and “Eastern Blvd.” projects were all built simply to serve the needs of the automobile and feed traffic to Triboroughs Toll Booths. Due to the roads in Queens, Manhattan, and the Bronx, Triborough soon became the greatest machine for magnifying traffic that NYC that the world had ever seen. Traffic magnified year after year, and every single one of those vehicles had to pay tolls. Moses, who helped author the modern constitution of NY State when he worked for Governor Al Smith, conducted business in the shadowy world of an “authority,” or public benefit corporation, which he had christened as the “Triborough Bridge Authority.” Moses literally wrote the laws governing such “authorities” and was able to game the system at every step. Today his authority is called the Triborough Bridge and Tunnel Authority, which was incorporated into the Metropolitan Transportation Authority (MTA) by Governor Nelson Rockefeller in 1968. Today, Triborough is officially part of the MTA Bridges and Tunnels unit, but it still carries an obscene number of vehicles and collects shed loads of cash at those toll booths. Robert Moses (December 18, 1888 – July 29, 1981) was the “master builder” of mid-20th century New York City, Long Island, Rockland County, and Westchester County, New York. As the shaper of a modern city, he is sometimes compared to Baron Haussmann of Second Empire Paris, and is one of the most polarizing figures in the history of urban planning in the United States. He changed shorelines, built bridges, tunnels and roadways, and transformed neighborhoods forever. His decisions favoring highways over public transit helped create the modern suburbs of Long Island and influenced a generation of engineers, architects, and urban planners who spread his philosophies across the nation. Never elected to public office, Moses was responsible for the creation and leadership of numerous public authorities which he could control without having to answer to the general public or to elected officials. It is due to Moses that there are a disproportionate number of public benefit corporations in New York state, which are the prime mode of infrastructure building and maintenance in New York, and are currently responsible for 90% of the state’s debt. As head of various authorities, he controlled millions in income from his projects’ revenue generation, such as tolls, and he had the power to issue bonds to borrow vast sums, allowing him to initiate new ventures with little or no approval from legislative bodies, bypassing the usual power of the purse as it normally functioned in the United States, and the cumbersome process of citizen comment on major public works. The jewel in Robert Moses’s crown was always mighty Triborough, and it was the center of his construction empire. Using the proceeds from the tolls on the bridge, and the unique freedom from the election cycle which Mayors and Governors were and are beholden to, the “authority” became a shadow government. 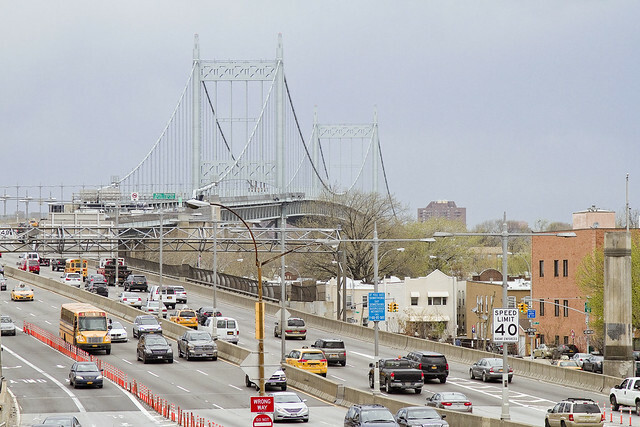 Moses was able to wield incredible amounts of credit through the issuance of attractively priced municipal bonds guaranteed by Triborough’s millions in toll proceeds. This made him very popular with banking interests, and the huge amounts of cash and credit he had allowed Moses to build anything he wanted. Wherever he wanted. Moses’s offices were on Randall’s Island, adjoining the counting rooms for the bridges tolls. 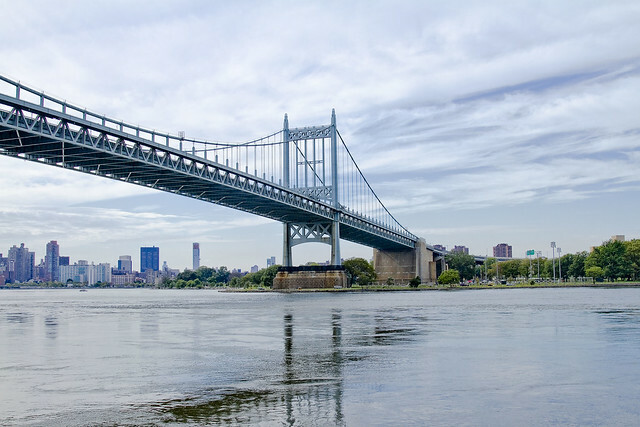 Originally named the Triborough Bridge Authority, the authority was created in 1933 as a public-benefit corporation by the New York State Legislature. It was tasked with completing construction of the Robert F. Kennedy (Triborough) Bridge, which had been started by New York City in 1929 but had stalled due to the Great Depression. With the last merger in 1946, the authority was renamed the Triborough Bridge and Tunnel Authority. Generating millions of dollars in toll revenue annually, the TBTA easily became a powerful city agency as it was capable of funding large capital projects. From the 1940s-60s, the TBTA built the Battery Parking Garage, Jacob Riis Beach Parking Field, Coliseum Office Building and Exposition Center and East Side Airlines Terminal, as well as many parks in the city. The bridge’s 3.5 miles of roadway include a suspension span to Queens, a vertical lift bridge to Harlem in Manhattan and a fixed truss bridge to the Bronx-all converging at a huge traffic junction on Randall’s Island. The Queens span is 1,380–feet long and has four lanes in either direction. 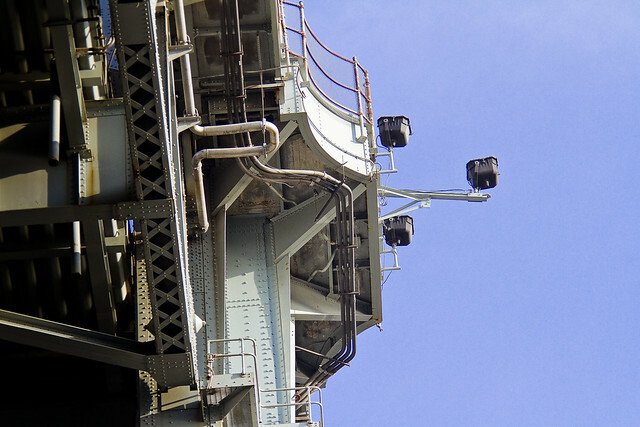 It has a clearance of 135 feet above the river, high enough for ships to pass under. The Harlem River lift span (as it is commonly called) in Manhattan has three lanes in either direction and moves its center section up and down like an elevator to allow tall marine traffic to pass. The Bronx crossing has three lanes in either direction over its framework of steel beams that form interconnected triangles, making the structure light and strong. There is a school of thought out there which suggests that the heroic performance of American industry during the Second World War was due to the industrial orders which Moses placed during the 1930’s for materials needed to construct the bridge and its approaches. The steel factories of Pittsburgh, concrete factories up and down the East Coast of the United States, the railroads and cargo ships which carried the material into NYC – all served to put American industry back to work. Think about the corollary supply lines for everything that was needed to make it – coal, iron, coke etc. If Pearl Harbor would have occurred in a world in which there had been no Triborough project, it would have taken as long as two years to stoke the furnaces and rehire a work force to build the weapons of WW2. 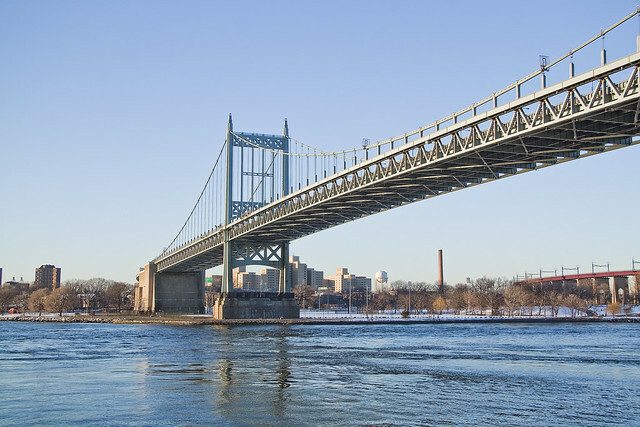 Triborough, as the name implies, touches down in three of the boroughs of NYC. It connects Manhattan, Bronx, and Queens. The East River suspension bridge spans a part of the river called Hells Gate. It also sits on one of the lesser islands of the archipelago of New York Harbor, Wards Island. Wards has been connected to its neighbor, Randall’s Island during the 20th century by landfill, but they used to be distinct land masses separated by a tidal strait. Wards Island is kind of a weird place. After the war ended, Jaspar Ward and Bartholomew Ward took ownership of the island that later carried their surname. Although a small population had lived on the island since as early as the 17th century, the Ward brothers developed the island more heavily by building a cotton mill and building the first bridge to cross the East River in 1807, connecting the island with Manhattan at 114th Street. Burial of hundreds of thousands of bodies relocated from the Madison Square and Bryant Park graveyards. The State Emigrant Refuge, a hospital for sick and destitute immigrants, opened in 1847, the biggest hospital complex in the world during the 1850s. The New York City Asylum for the Insane, opened around 1863. An immigration station from 1860 until the 1892 opening of Ellis Island. Manhattan State Hospital, operated by the New York State Department of Mental Hygiene when it took over the immigration and asylum buildings in 1899. With 4,400 patients, it was the largest psychiatric institution in the world. The 1920 census notes that the hospital had a total of 6045 patients. It later became the Manhattan Psychiatric Center. 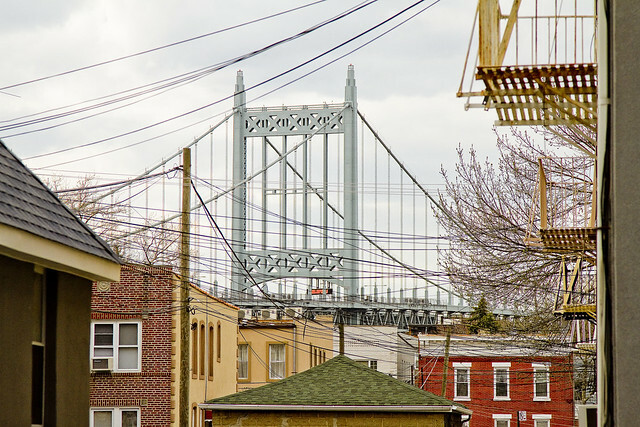 Shades of “Arkham Asylum” on Wards Island (from the Batman mythology) notwithstanding, Triborough – along with the Hell Gate Bridge – is the backdrop to life here in Astoria. Due to the rapacious real estate development currently underway in western Queens, this won’t last for long as residential towers continue to rise all along the waterfront. The view above is from the Queensboro Bridge, incidentally, looking north. Kirby Forensic Psychiatric Center, a maximum security hospital of the New York State Office of Mental Health (OMH), opened in 1985 and provides secure treatment and evaluation for the forensic patients and courts of New York City and Long Island. Most patients are received through the courts under Criminal Procedure Law (CPL) or through the OMH Commissioner’s office via the New York State Code of Rules and Regulations (NYSCRR) regarding hospitalization of the mentally ill. Treatment is provided in accordance with the current standards of professional care outlined by the Joint Commission of Accreditation of Health Organizations (JCAHO) and is carried out with respect for each patient’s privacy and rights, in agreement with his/her level of functioning and need for security. KFPC has an active staff education program as well as academic affiliations with several metropolitan area colleges and universities, to help assure quality treatment and state of the art care. The Manhattan Psychiatric Center is a New York-state run psychiatric hospital on 125th Street on Ward’s Island in New York City. As of 2009 it had 509 beds. The current building is 14-stories tall. The hospital’s roots date to 1848 when Ward’s Island was designated the reception area for immigrants. Some additional structures were originally part of Blackwell’s Island Lunatic Asylum, which opened around 1863. The building was significantly enlarged in 1871, and a Kirkbride Plan style building was built. After the immigration entry shifted to Ellis Island in 1892 the state took it over from Manhattan in 1899 and expanded it even further. At the time, it had 4,400 beds and was the largest psychiatric hospital in the world. At the time it was one of two psychiatric hospitals for residents of Manhattan that had been take over by the state. The other psychiatric hospital would become the Central Islip Psychiatric Center in Central Islip, New York. Both hospitals were referred to as Manhattan State Hospital. It later became the Manhattan Psychiatric Center. The facility is currently run by the New York State Office of Mental Health. As a rule, I don’t use the modern appellations for Queensboro (Ed Koch) and Triborough (Robert F. Kennedy). I will, once the Brooklyn Bridge is renamed for Michael Bloomberg or Chuck Schumer.